Some people can’t start the day without a cup (or three) of fresh, hot coffee. If you’re one of those people, you probably rely on your coffee maker to deliver your first daily dose of caffeine. 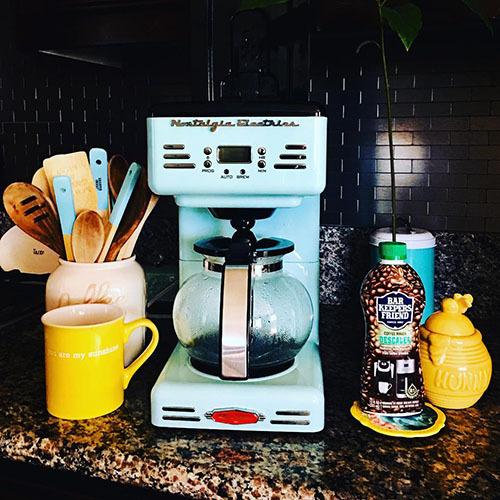 To keep your automatic drip coffee maker working well, you’ll need to descale it every three months, or more frequently, if you notice hard water deposits. If minerals accumulate inside your machine, the heating element won’t work as well – and it may stop working altogether. If you’ve never thought to descale a coffee maker before, you’re not alone – it’s one of those tasks that’s easy to forget. But it doesn’t take much time or effort, so set aside 20 minutes to perform this simple maintenance task, and you’ll be rewarded with a fresher-tasting cup of coffee. All you need to descale your coffee maker is Bar Keepers Friend Coffee Maker Descaler, water, and protective gloves. If you have marble, granite, or other natural stone countertops, cover them before you start descaling – splashes and spills could potentially damage those surfaces. Remove any disposable filter from your coffee maker, and make sure the reservoir and carafe are empty. Fill your carafe with cold water, and put on your protective gloves. For every eight ounces of water in the carafe, add one ounce of Bar Keepers Friend Coffee Maker Descaler (so, if you have a 12-ounce carafe, you would add 1.5 ounces of the descaling solution). Pour the contents of the carafe into the coffee maker reservoir and start the brew cycle. When the brew cycle is complete, empty the carafe and rinse it thoroughly. Fill the carafe with cold water only, pour that into the reservoir, and restart the brew cycle to rinse away the cleaning solution from the inside of the coffee maker. When the brew cycle is complete, dump the contents of the carafe, and you’re finished descaling! Bar Keepers Friend Coffee Maker Descaler is packaged in a 12-ounce bottle, so if you’re only using an ounce or two of the solution every three months, the bottle should last more than a year. Using this BKF product to descale a coffee maker is an affordable alternative to replacing your machine because of hard water build up.